Lottery players in states that play Mega Millions are getting the chance to vie for the seventh-largest lottery prize in U.S. history. The Mega Millions jackpot for tonight's drawing is up to $330 million thanks to brisk sales pushing the big prize higher. That works out to about $208 million if taken as a lump sum. The game is similar to Powerball -- players try to win by matching five regular numbers plus the "Mega ball." Tickets cost $1. Besides the jackpot, prizes range from $2 to $250,000. Drawings are held every Tuesday and Friday night. 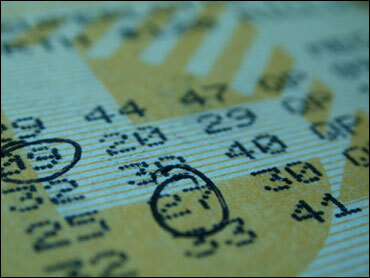 The largest Mega Millions jackpot was $390 million in 2007. The prize was shared by two players in Georgia and New Jersey. On "The Early Show," Special Contributor Taryn Winter Brill reported that, during the lunch hour on Monday in New Jersey alone, 4,000 tickets were cranked out per minute. Brill, who talked to the station attendant at The Singing Gas Station in Tom's River, N.J., who said he usually sells 300 to 400 tickets a day. He told Brill he expects to sell a whopping 2,000 tickets by the end of Tuesday. The station, Brill noted, has luck on its side because it sold a winning ticket in March 2009 -- for $216 million. The Mega Millions game, which expanded last year under a cross-selling agreement with Powerball, is available in 41 states and the District of Columbia.